Driving home from work on Wednesday, I was trying to figure out what sort of nails I was going to do for the next day and had a hundred different ideas going through my mind. So when I opened my front door, it was a nice surprise to see that that the new Models Own Nail Art Tool Kit* had arrived through my letterbox and solved all my design dilemmas in one fell swoop. The Nail Art Tool Kit is an exciting addition to the current range from Models Own - we've seen nail art pens and the Sticky Fingers collection from them so far, both of which help us to create our own nail art at home - but now we have a whole range of options with the different brushes and dotting tools. Index - I used the fan brush, first with Models Own Purple Glaze, then with Models Own Cerise Shine. I've never used a fan brush before, though I do have one somewhere... there's a certain skill to it I think which I haven't quite mastered yet. I did realise I had to dab off the polish to make the brush a bit dry otherwise it splodges. I'm not a huge fan of the overall look of this nail, but I'll do some research into how to use a fan brush properly! 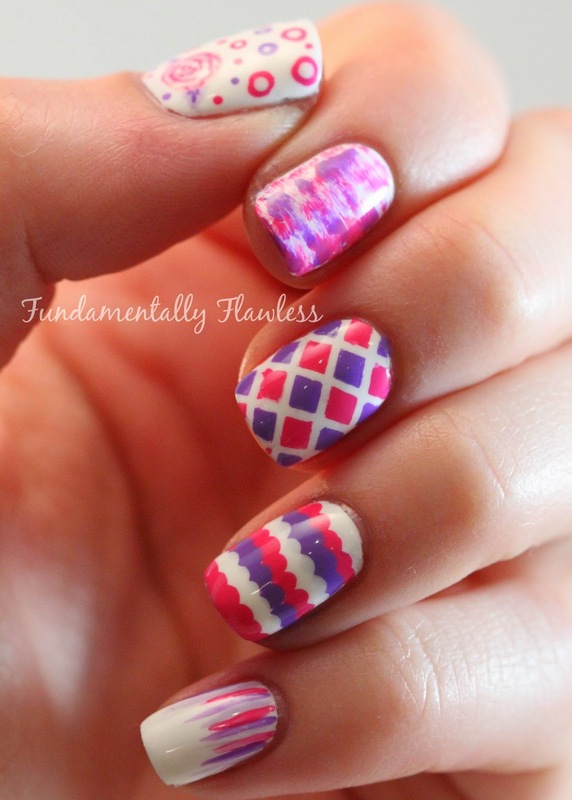 Middle - Using the striping tape in diagonal lines across my nail, I then used the short detailing brush to fill in the diamonds with the pink and purple polishes, before removing the tape before the polish dried. This was quite fiddly, but not too tricky - and I love how this nail looks. I'll definitely be trying this again with different colours. Ring - I used the big dotting tool to do this ruffle design, following Chalkboard Nails' tutorial. This is a super easy design - again not one I've done before, but one I'll definitely do again. Little - For this Nailasaurus-inspired waterfall design, I used the striping brush to create the long thin lines. 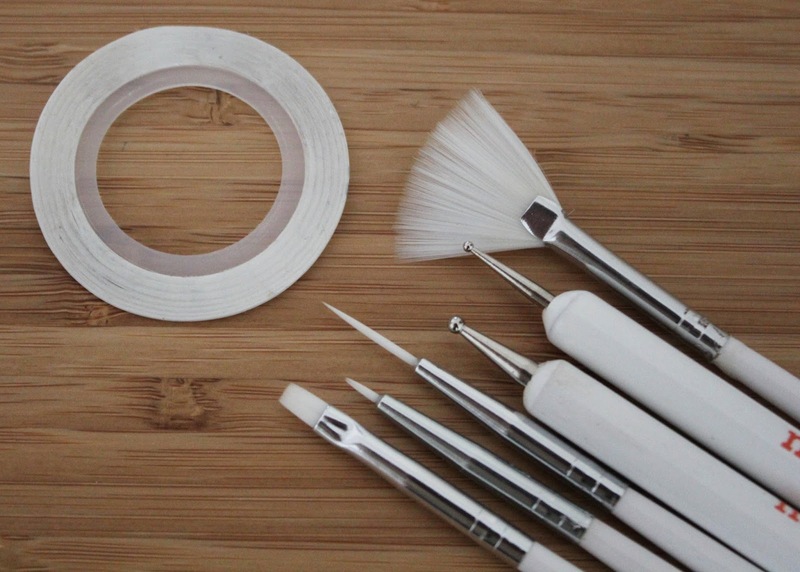 I'm a big fan of a striper brush and often use one in my nail art. This one is a good thin one and worked well on these lines. My thumb ended up being a bit of a doodle nail - I used the dotting tools for the dots, then did a smaller white dot in the middle of some of them (a double dotticure, if you will). 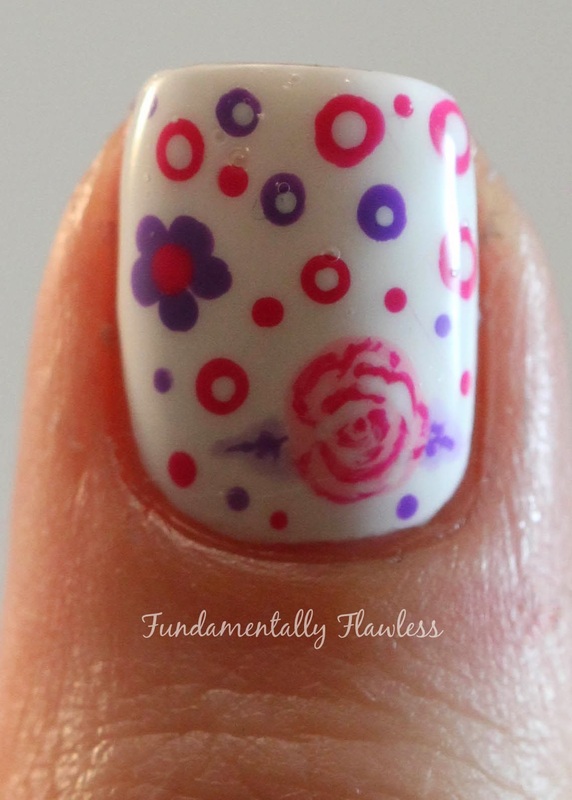 The purple flower was also done with a the dotting tool and for the rose I used the short detailing brush. I did a tutorial yesterday on Instagram on a rose design, if you're interested in how I did this rose. 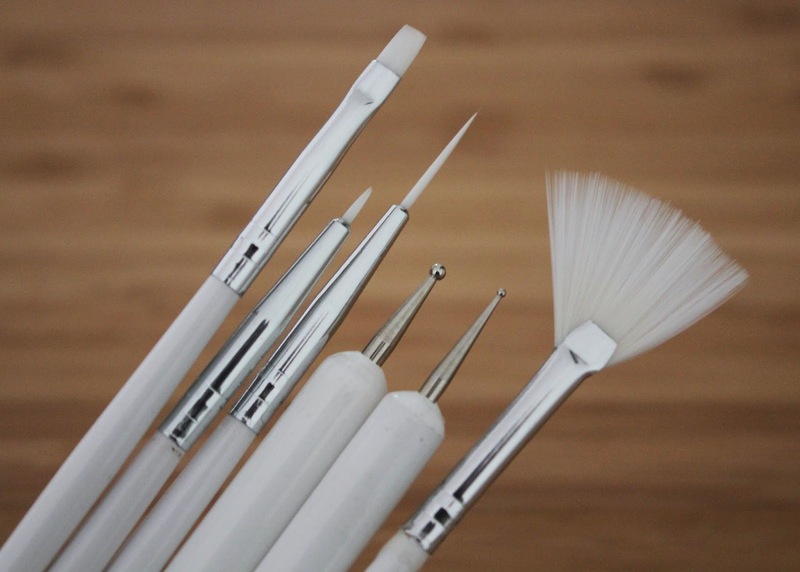 Although I didn't use the flat/wide brush for nail art, I did use it as a clean up brush! The flat end makes it ideal for dipping in acetone and cleaning up those messy edges and cuticles if you get a bit overzealous with the polish application. Overall thoughts? 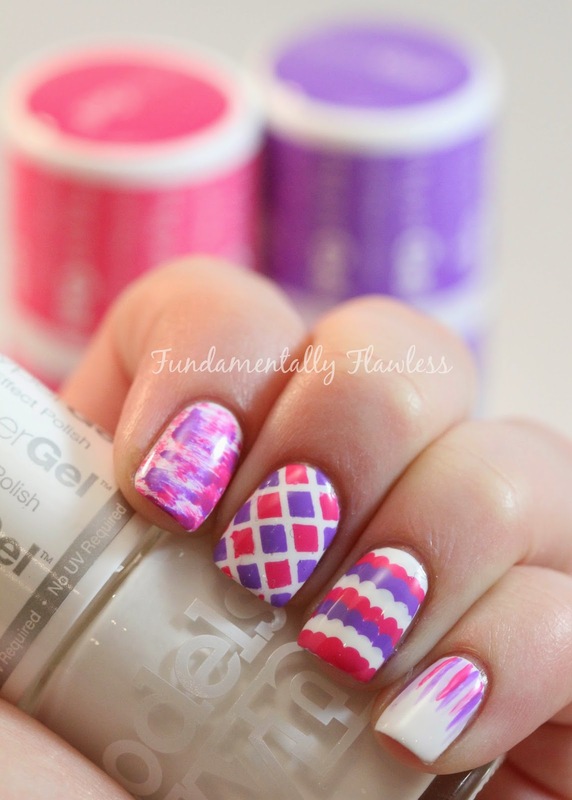 I think this is a fab starter kit for any budding nail art enthusiasts, or even for those with more experience. At £8 it's a bit pricier than a lot of nail art brush sets you'll find on eBay, but they often don't have the combination of brushes, dotting tools and tape in one pack, which is what I think makes this a good bundle buy. The quality of the brushes also seems good - though time will be the best judge of that (brushes don't really like acetone in the long term) - but so far all the tools do what I would like them to do and the bristles seem to be firmly in the ends of the brushes (another issue I've had with brushes before). I was impressed with the striping tape, too, which wasn't too flimsy and didn't tear too easily. Watch out for lots more nail art to come from me now that I've got these among my tools! Would you like to see tutorials for any of the designs above? Let me know in the comments below! 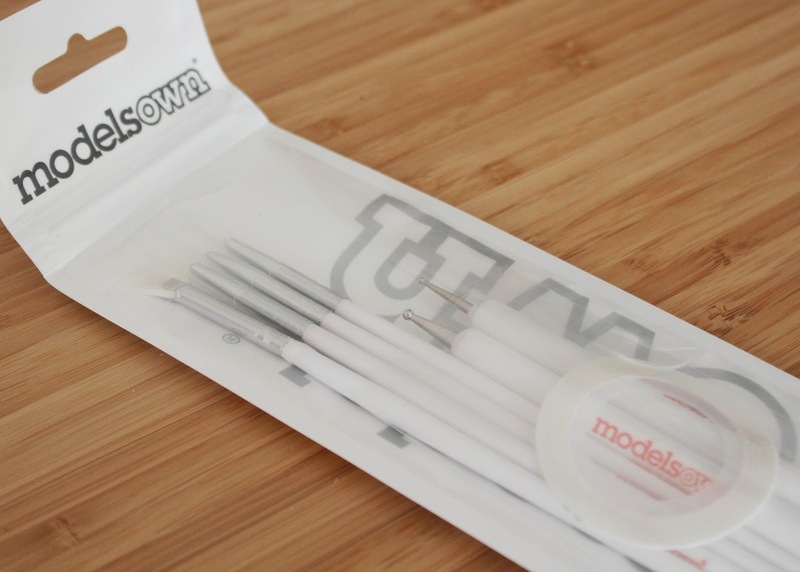 The Models Own Nail Art Tool Kit is available now from www.modelsownit.com and in Boots stores. It is launching at the Models Own Bottleshops on May 3rd. Looks cool. .. thumb is my fav. Thanks! Yes that was my surprise favourite too! 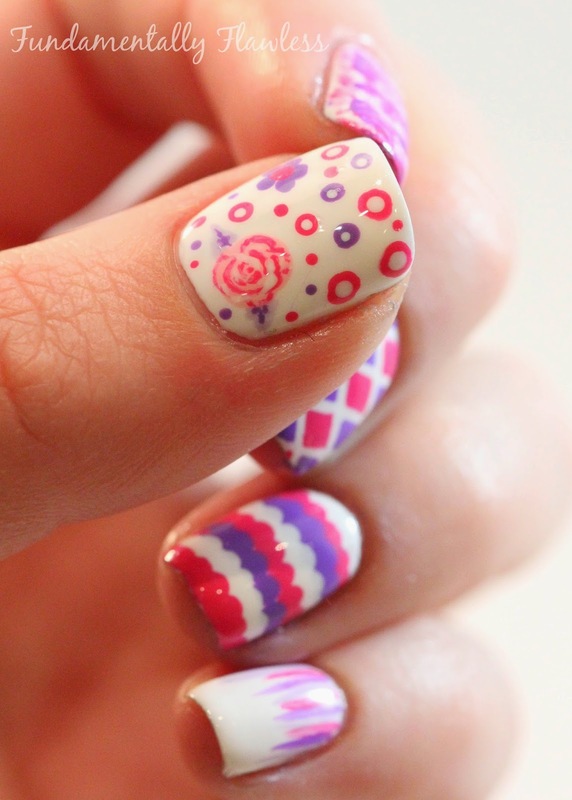 Cool design, I love your roses, and also your ruffle nail - really cute!